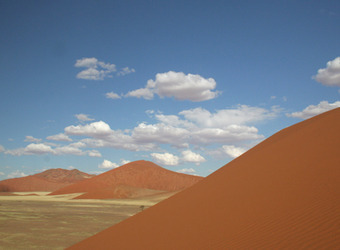 Namibia is a land of vast and beautiful landscapes. I'll be honest, it's not the best place to visit for your first time to Africa. For that, I'd choose a more traditional safari country - Botswana, South Africa, Tanzania, Kenya. That's not to say there isn't amazing game viewing in Namibia - there is - but it's not the quintessential safari experience you'll find in those other countries. BUT, Namibia has so much more to offer beyond the game viewing. The red dunes of Soususvlei are like no other landscape on the planet. The opportunity to track wild rhinos on foot is exhilarating! The cultural interactions with the Himba tribes was fascinating. Namibia may not be your first African visit, but once you go, you'll be yearning to go back!